Hakusan, Japan, November 22, 2017 – EIZO Corporation (TSE: 6737) today announced that the Hybrid Gamma PXL function, which improves efficiency of monochrome and color image interpretation, will now be available on more models from 2018. Additionally, a recent study undertaken by the Kumamoto Chuo Hospital of Japan, shows the effectiveness of the function. With recent technological advancements in the medical field, doctors are increasingly combining the use of monochrome images such as x-ray, MRI, and CT with color images such as endoscopy, ultrasound, and nuclear medicine. When viewing monochrome medical images, a GSDF (Grayscale Standard Display Function) is required as defined by DICOM Part14, whereas when viewing color medical images, a y2.2 gamma curve defined by sRGB is required. Typically this means that monochrome and color images cannot be viewed together. However by using EIZO’s Hybrid Gamma PXL function, both monochrome and color images can be displayed on the same screen in the ideal grayscale/gamma curve for each. Hybrid Gamma PXL is a new feature that was introduced with the RadiForce RX560 on July 3, 2017. The function automatically distinguishes between monochrome and color images pixel by pixel, creating a hybrid display where each pixel has optimum grayscale or gamma curve. This gives it greater accuracy and reliability than conventional area-detection methods. Hybrid Gamma PXL will be included with the RadiForce RX660, RadiForce RX350 and RadiForce RX250 color monitors shipped after January 2018. Date of availability varies by country, so contact the EIZO Group Company or distributor in your country for details. 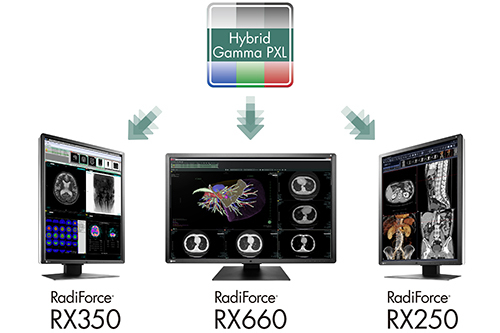 From May to July 2017, the Kumamoto Chuo Hospital, Japan, evaluated the Hybrid Gamma PXL function included on the RadiForce RX560. Radiologists with more than 12 and 27 years of experience visually assessed the monitor using several evaluation images, and scores were given based on the performance of each image. Approximately a 37% improvement was noted when comparing the use of a color monitor with Hybrid Gamma PXL to one without it. In addition, Hybrid Gamma PXL was found to operate equally as well as monochrome monitors with GSDF when displaying monochrome images. With the Hybrid Gamma PXL function, EIZO continues to provide a high degree of customer assurance to medical professionals and their patients.